Shop Vons online at Vons.com where it's easy to get quality groceries, fresh produce, meat and seafood delivered to homes and businesses. Great for busy families and individuals short on time or anyone that wants a quick and easy way to do the weekly grocery shopping. Vons.com currently delivers in these areas: Los Angeles, Inland Empire, Orange County, San Diego, Ventura, and Las Vegas. 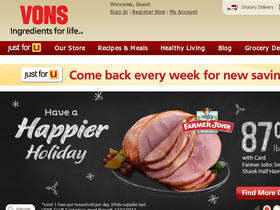 Save on your next delivery with Vons discounts, Vons coupons and Vons savings found here on 58Coupons.com. Get Free Delivery & free product with your first online order using this promo code. Click link. Vons.com is now offering Free Delivery on your first order (over $50). Regular delivery charge is $12.95. Click link and use code at checkout to save. Head on over to Vons.com to check out the online weekly specials where you can save 20% or more. Be sure to check weekly as the specials change weekly.